Weinholz Auto & Tire Exchange! (6391 Capitol Ave., Diamond Springs) for donating 2 new tires for our response trailer! Safeway, Placerville: For providing all the sandwhiches we could possibly eat at the June 13, 2015 training. Starbucks, Broadway, Placerville - for providiong morning coffee and fixings for our January 16, 2016 training. Pleasant Valley Community Hall and Pleasant Valley Fire Safe Council : For providing facilities for trainings and tables and chairs needed and partnering with us on many community outreach programs. Safemaxx Vehicle Storage: For allowing us a secure location to house our response trailer. Who do I call for evacuation or a welfare check on my animals? Sclar will respond as directed by El Dorado County Animal Services. We cannot self-deploy or respond directly to phone calls for assistance. PLEASE! Please! please! make preparations for evacuation BEFORE it becomes a critical issue. Animal Services has a very informative brochure. Please click on the above link and avail yourself of this valuable information. Have a plan! Know where you will take your animals; Make arrangements ahead of time with friends or a family member in another area of the county to temporarily house your animals. 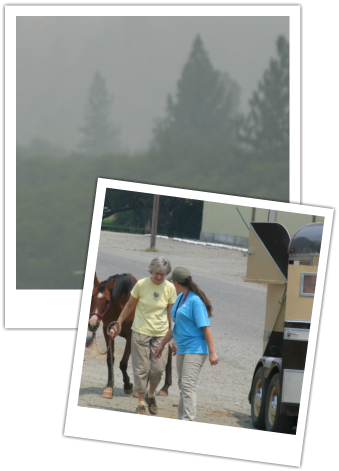 We are a Large Animal Emergency Evacuation Program approved for operation in El Dorado County. Please join us in our endeavors. We are seeking dedicated volunteers to help evacuate large animals during disasters, such as fires or floods. On our Calendar page, you'll find important dates. On our Programs pages, you will find more about our clinics, training classes, and emergency simulations. You can also learn about our many volunteer and donor possibilities, ranging from direct rescue operations, to clerical tasks and fundraising. Time is always valued. If you would like to help and cannot find the time, please make a donation. Our funding is strictly from fundraisers and donations. Your check, payable to Sclar will be greatly appreciated. Please mail any donations to us at PO Box 445; Somerset CA 95684 or, click the Pay Pal link above. Our training continues and we continue to urge you to remain fire safe throughout the year. The EDSO-OES Alert Notification System includes some landline and cellular phone numbers. If you would like to be contacted on your home phone, cellular phone, work phone, email, fax or via instant messaging - you must register that information. All information you provide will be kept strictly confidential. Mission Statement We are a group of trained, organized volunteers who will do our best to help evacuate animals in time of disaster. Fire personnel fight fires, saving human lives and preserving property. Usually, they do not have the time, the training, or the wherewithal to evacuate animals. This is where we come in. Our purpose is to help save the animals. Functioning in a disaster under the El Dorado County Office of Emergency Services (OES), and Animal Services, our membership's Registered Disaster Service Workers will endeavor to evacuate animals from areas in danger. We are dispatched and directed through Animal Services. Although we began as a large animal evacuation group, we soon realized we could not leave other pets behind if we had the opportunity to remove them. Our trailer teams will do their best to remove all pets from danger. Member information forms are posted in the Forms section. Please feel free to print, complete and mail to us or bring to a meeting (see Calendar for regularly scheduled meetings). Our meetings are the 2nd Tuesday of each month. Plan on attending, either as our guest and potential member or if you're just curious. Amazon Smile: Purchse goods through amazon? They will donate a % of your purchase. You will need to register at Amazon, stipulate "Sclar Large Animal Emergency Evacuation"
Is a "portal" through which you can access over 680 online stores. Participating stores give rebates to Sclar based on qualified purchases. All you need to do is register with iGive.com (it's free!) and "enter" the online stores through the portal. It doesn't cost you a thing! !